People march in Springfield on Tuesday. More than 1,000 people joined the Illinois Women March on Springfield to demand for more progressive legislation. 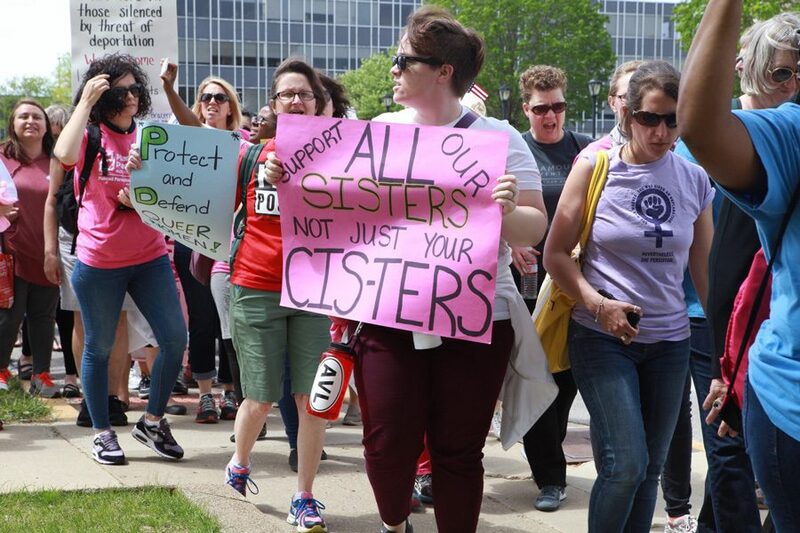 More than a thousand activists gathered Tuesday outside the state capitol as part of Illinois Women March on Springfield, an effort to pressure lawmakers to adopt more progressive legislation. A large coalition of elected officials, political activists and advocacy groups demonstrated for progressive causes like abortion rights and a higher minimum wage. Attendees heard from a series of speakers before going into the capitol building to lobby lawmakers. Tracy Baim, one of the march’s chief organizers, told The Daily that assembling a broad coalition of interest groups represented a new political strategy in the state. Baim said the Women March on Springfield was inspired by the wave of similar marches that took place across the country following the inauguration of President Donald Trump. Tuesday’s march on Springfield occurred against the backdrop of a historic budget impasse. State lawmakers have failed to pass a budget for more than two years, the result of a longstanding confrontation between Republican Gov. Bruce Rauner and the Democrat-controlled legislature. State agencies and universities have avoided a shutdown only through a series of stopgap measures. Attendees at the march insisted that the state pass a “responsible budget” that would leave state welfare programs intact. A robust slate of Democratic leaders turned out for the march, including Illinois House Speaker Michael Madigan (D-Chicago) and civil rights leader Rev. Jesse Jackson. Gubernatorial candidates Chicago Ald. Ameya Pawar (47th), state Sen. Daniel Biss (D-Evanston), businessmen J.B. Pritzker and Chris Kennedy also attended the rally. Biss spoke to marchers in the rotunda of the State Capitol, expressing his support for the march while touting his progressive credentials. As the march was taking place, the Illinois House passed a bill protecting access to abortion in the state. The bill allows for taxpayer funds to go toward the procedure. Madigan spoke to protesters about the bill before proceeding into the capitol to vote. He encouraged the audience to take note of which lawmakers supported the bill.